Stone Oakvalley's Real 80's Classic VideoTexter v1.0 released! Finally, an idea that begun in the early 90's (1993 to be exact) has been reinvented in 2011 and now in march 2017 it is finally available for release! 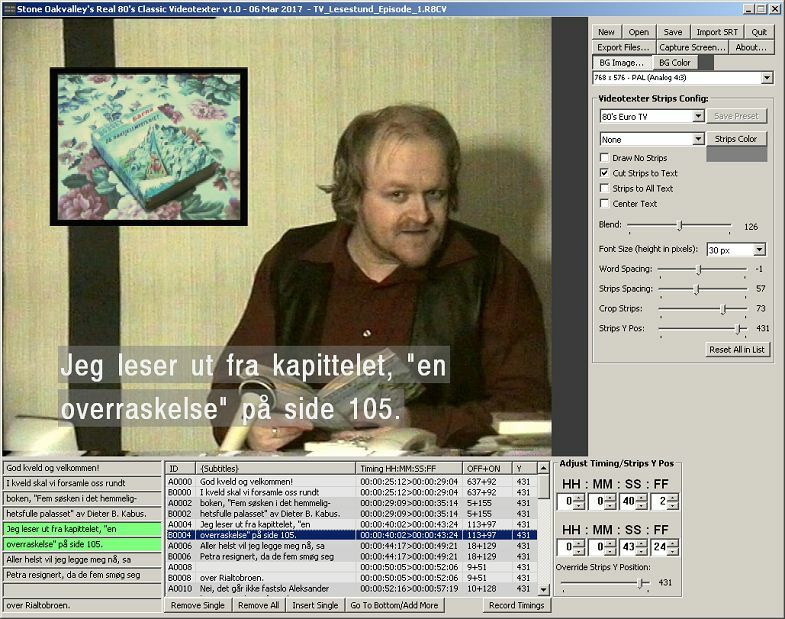 Stone Oakvalley's Real 80's Classic Videotexter (SORCV) (Freeware) is a sleek software that is capable of producing old-school looking subtitles as seen during the 80's, 90's on both TV-Channels and typical rental VHS videos. The subtitle / caption / videotexter design tries to mimic as much as possible the old days. It is also very lightweight, fast and easy to use. Fonts are pre-rendered by me to deny users from choosing lame/awful fonts or to use the dreadfull ClearType rendering invented failure by Microsoft! This software is classic perfect example on how to code/design a program correctly in todays world of bloating, childish icon decease, airy GUI about and just plain simple BAD design and workflow of all the other software out there. I set the standard with my software design - just because I said so. This software is free, will always remain free. An uprising to all other coders who charge money for simple coding projects! You've just been had by Stone Oakvalley! Visit the Dashboard for download and more information!